Windsor Castle, in Windsor in the English county of Berkshire, is the largest inhabited castle in the world and, dating back to the time of William the Conqueror, is the oldest in continuous occupation. The castle's floor area is approximately 484,000 square feet. Together with Buckingham Palace in London and Holyrood Palace in Edinburgh, it is one of the principal official residences of the British monarch. Queen Elizabeth II spends many weekends of the year at the castle, using it for both state and private entertaining. Most of the kings and queens of England have had a direct influence on the construction and evolution of the castle, which has been their garrison fortress, home, official palace, and sometimes their prison. The castle's history and that of the British monarchy are inextricably linked. Chronologically the history of the castle can be traced through the reigns of the monarchs who have occupied it. When the country has been at peace, the castle has been expanded by the additions of large and grand apartments; when the country has been at war, the castle has been more heavily fortified. This pattern has continued to the present day. Plan of Windsor Castle. Throughout this article the letters marked in red on this plan will be used to reference locations discussed. Over its 1,000-year history, the design of Windsor Castle has changed and evolved according to the times, tastes, requirements, and finances of successive monarchs. Nevertheless, the positions of the main features have remained largely fixed and the modern plan below is a useful guide to locations. The castle today, for example, remains centered on the motte or artificial hill ("A" on the plan) on which William the Conqueror built the first wooden castle. The highly visible landmark of the castle, the Round Tower ("A"), is in reality far from cylindrical, its shape being dictated by the irregular, but seemingly round, man-made hill on which it sits. The castle's layout dates back to the medieval fortifications. The Round Tower divides the castle into two distinct sections known as wards. 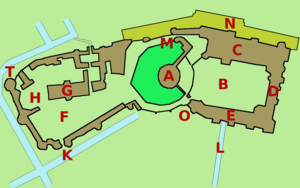 The Lower Ward ("F") is home to St. George's Chapel ("G"), while the upper ward ("B") contains the private Royal Apartments ("D") and the more formal state rooms ("C"), which include Saint George's Hall, a vast room which has a ceiling decorated with the coats of arms of past and present members of the Order of the Garter. The immediate environs of the castle, known as "The Home Park," comprise parkland and two working farms along with many estate cottages mainly occupied by employees. The estate of Frogmore also lies within the Home Park, Frogmore House and Gardens are open to the public on certain days of the year (the remainder of the Home Park is private). The Home Park forms the northern part of the more extensive—though now sadly depleted Windsor Great Park. 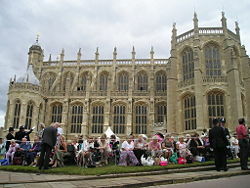 In the town of Windsor at the foot of the castle stands a private school ("St. George's, Windsor Castle") which provides choristers to the Chapel. Eton College is located about a mile to its north. Windsor Castle was first built by William the Conqueror, who reigned from 1066 until his death in 1087. His original wooden castle stood on the site of the present Round Tower ("A"). The castle formed part of his defensive ring of fortifications surrounding London, the site chosen in part because of its easily defensible position. At this time the castle was defended by a wooden palisade rather than the thick stone walls seen today. The original plan of William's castle is unknown, but it was purely a military base, and nothing structural survives from this early period. His successor, William II, is thought to have improved and enlarged the structure, but the Conqueror's youngest son King Henry I was the first sovereign to live within the castle. Concerned for his own safety due to the instabilities of his reign, he and his wife, Matilda of Scotland, took up residence there and celebrated Whitsuntide at the castle in 1110. His second marriage, to Adela, the daughter of Godfrey of Louvain, took place in the castle in 1121. The earliest surviving buildings at Windsor date from the reign of Henry II who came to the throne in 1154. He replaced the wooden palisade surrounding the old fortress with a stone wall interspersed with square towers. A much-altered part of this defensive wall can be seen on what is today the east terrace. Henry II also built the first stone keep on the irregular mound at the center of the castle. In 1189, the castle was besieged during the First Barons' War against Prince John. The King's Welsh troops eventually took flight, and John escaped to France. Later, in 1215 at Runnymede, John, now King, was forced to sign the Magna Carta. In 1216, again during the First Barons' War, the castle was again besieged, but this time withstood the assault despite severe damage to the structure of the lower ward. This damage was repaired in 1216 by King John's successor Henry III, who further strengthened the defenses with the construction of the western, curtain wall, much of which survives today. The oldest existing parts of the castle include the curfew tower ("T"), constructed in 1227. The interior of the tower contains the former castle prison, and also the remnants of a "Sally port," a secret exit for the occupants in a time of siege. The upper story contains the castle bells placed there in 1478, and the castle clock of 1689. The French-style conical roof is, however, a nineteenth-century addition. Henry III died in 1272, and there seems to have been little further building carried out at the castle until the reign of King Edward III (1327–1377). The current Round Tower dates to the time of Edward III, although it stood lower than today. King Edward III was born in the castle on November 13, 1312, and was often referred to as "Edward of Windsor." Beginning in 1350, he initiated a 24-year rebuilding program by demolishing the existing castle, with the exception of the Curfew Tower and some other minor outworks. Henry II's keep (the Round Tower) was replaced by the present tower, although it was not raised to its present height until the nineteenth century. The fortifications too were further increased. The castle's chapel was substantially enlarged, but plans to build a new church were not executed, probably due to the scarcity of manpower and resources following the Black Death. Also dating from this time is the Norman Gate ("M"). This large and imposing gate at the foot of the Round Tower is the last bastion of defense before the Upper Ward ("B") where the Royal Apartments are situated. In 1348 Edward III established the Order of the Garter, whose annual ceremony still takes place in St George's Chapel. In 1390, during the reign of Richard II, it was found that Saint George's chapel was close to collapse, and a restoration process was undertaken. King Edward IV (1461–1483), the first Yorkist King, began the construction of the present St. George's Chapel. In reality the chapel, begun in 1475, is more a miniature cathedral and royal mausoleum than a chapel. Its architecture is an exercise in the Perpendicular Gothic style. The building was one of the first truly grand pieces of architecture within the castle precincts. The construction of the chapel marked a turning point in the architecture at Windsor. The more stable political climate following the end of the Wars of the Roses meant that future building tended to be more considerate of comfort and style than of fortification. In this way the castle's role changed from that of royal bastion to that of a royal palace. One example of this is the "Horseshoe Cloister" ("H") from 1480, built near the chapel to house its clergy. This curved brick building is said to be in the shape of a fetlock: one of the badges used by Edward IV. Restoration work in 1871 was heavy, and little of the original building materials remain. Despite these improvements, Windsor remained a very bleak residence. Henry VIII (1509–1547) rebuilt the principal castle gateway in about 1510, siting it in such a place that, should the gateway fall in an attack, further invasion into the castle would involve an uphill battle. The coat of arms above the arch and portcullis bears the pomegranate badge of the king's first queen, Catherine of Aragon. Henry VIII's successor and son, the boy King Edward VI (1547–1553), disliked living at the castle, but his sister, Queen Elizabeth I (1558–1603) spent much of her time at Windsor and regarded it as the safest place in her realm. She would retire there in moments of anxiety, "knowing it could stand a siege if need be." She too contributed to the transformation by constructing the north terrace ("N") as a place to exercise, and over it she built a covered gallery, a very early example of what was later to be known as a conservatory. This building has survived relatively unaltered. Still containing an enormous Tudor fireplace, it today houses the Royal Library. Elizabeth I was followed by James I, and he by his son Charles I, neither of whom made significant changes to the castle. However, following the deposition of Charles in the English Civil War, the castle became the headquarters of Oliver Cromwell's New Model Army. Windsor Castle fell to Cromwell's Parliamentarians early in the hostilities. Prince Rupert of the Rhine arrived to retake the town and castle a few days later, but though he severely battered the town, he was unable to retake the castle. Under Parliamentarian jurisdiction the castle suffered, as the garrison stationed there was underpaid and was allowed to loot the castle's treasures. For the duration of the Commonwealth period, the castle remained a military headquarters, and a prison for more important Royalists captured. For a short time prior to his execution in 1649, Charles was imprisoned in the castle, although in today's terminology house arrest would be a more accurate term. Charles' body was smuggled back to Windsor in the dead of night through a snowstorm to be interred without ceremony in the vault beneath the choir in St. George's Chapel, next to the coffins of Henry VIII and his wife Jane Seymour. The Restoration of the monarchy in 1660 was to prove the first period of significant change to Windsor Castle for many years. Charles II did much to restore and refurnish the castle from the damage suffered during the civil war. At this time Versailles was being constructed in France, and with this in mind Charles II laid out the avenue known as the Long Walk ("L"). Running south from the castle, this avenue runs for three miles and is 240 feet wide. The original elms the King planted have since been replaced with chestnuts and planes (sycamores). The Long Walk was not the only part of Windsor to be inspired by Versailles. Charles II commissioned the architect Hugh May to rebuild the Royal Apartments and St George's Hall.
. May replaced the original Plantagenet apartments on the north terrace with the cube-like Star Building. The interiors of these new apartments were decorated with ceilings by Antonio Verrio and carving by Grinling Gibbons. The King also acquired tapestries and paintings to furnish the rooms. These artworks were to form the core of what was to become known as the Royal Collection. Three of these rooms survive relatively unchanged: the Queen's Presence Chamber and the Queen's Audience Chamber, both designed for Charles II's wife Catherine of Braganza, and the King's Dining Room. These retain both their Verrio ceilings and Gibbons' panelling. Originally there were 20 rooms in this style. Some of Gibbons' carvings were rescued at various times when alterations were being made in the name of change or restoration, and in the nineteenth century these carvings were incorporated into new interior design themes in the Garter Throne Room and the Waterloo Chamber. Following the death of Charles II in 1685, the Castle fell slowly into a state of neglect. Needless to say, while the precincts and park remained a complex of inhabited royal mansions, the sovereigns themselves preferred to live elsewhere. During the reign of William and Mary (1689–1702), Hampton Court Palace was enlarged and transformed into a huge, modern palace. Later, Queen Anne preferred to live in a small house close to the walls of the castle. It was not until 1804 – when King George III, and his wife, Duchess Sophia Charlotte of Mecklenburg-Strelitz, parents of 15 children, needed a larger residence than could be found elsewhere – that the castle was once again fully inhabited. The work carried out by Charles II had been on the contemporary, more classical, style of architecture popular at the time. Inigo Jones had introduced Palladianism to England during the time of Charles I; George III felt this style was not in keeping with an ancient castle, and had many of Charles II's windows redesigned and given a pointed Gothic arch, and thus the castle began once again to acquire its original, medieval appearance. 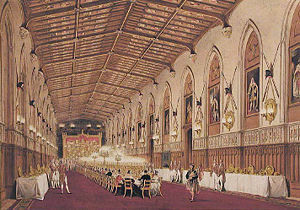 During this period Windsor Castle was once again to become a place of royal confinement. In 1811, King George III became permanently deranged and was confined to the castle for his own safety. During the last nine years of his life, he seldom left his apartments at Windsor. It was during the reign of King George IV between 1820–1830 that the castle was to undergo the greatest, single transformation in its history. George IV, known for his extravagant building at both Carlton House and the Royal Pavilion during his regency, now persuaded Parliament to vote him £300,000 for restoration. The architect Jeffry Wyatville was selected, and work commenced in 1824. The work took 12 years to complete and included a complete remodeling of the Upper Ward ("B"), private apartments ("D"), Round Tower ("A"), and the exterior facade of the South Wing ("E") which gave the castle its near symmetrical facade seen from the Long Walk. Wyatville was the first architect to view the castle as one composition, rather than a collection of buildings of various ages and in differing styles. As an architect he had a preference for imposing symmetry in architecture, whereas the castle which had evolved piecemeal over the previous centuries had no symmetry at all. Wyatville imposed a symmetry of sorts on the existing buildings of the Upper Ward, by raising the heights of certain towers to match others, and refacing the Upper Ward in a Gothic style complete with castellated battlements to match the medieval buildings, including St George's Chapel in the Lower Ward. The Round Tower had always been a squat structure, and now this was further accentuated by the new height of the buildings in the Upper Ward. Wyatville surmounted this problem by building on top of the Round Tower a hollow stone crown, basically a false upper story. Some 33 feet high, this crown gives the entire castle its dramatic silhouette from many miles away. Much of the interior of the Castle was given the same makeover treatment as the exterior. 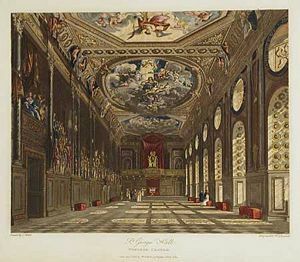 Many of the Charles II state rooms which remained after George III's redecorations were redesigned in the Gothic style, most notably St George's Hall (see illustration right), which was doubled in length. Wyatville also roofed over a courtyard to create the Waterloo Chamber. This vast hall lit by a clerestory was designed to celebrate the victors of the Battle of Waterloo and was hung with portraits of the allied sovereigns and commanders who vanquished Napoleon. The large dining table at the center of the chamber seats 150 people. The work was unfinished at the time of George IV's death in 1830, but was virtually completed by Wyatville's death in 1840. The lower ward in the 1840s. St George's Chapel is on the left and the Round Tower is center right. 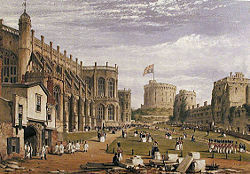 Queen Victoria and Prince Albert made Windsor Castle their principal royal residence. Many of their changes were to the surrounding parklands rather than the buildings. In particular, the "Windsor Castle and Town Approaches Act," passed by Parliament in 1848, permitted the closing and re-routing of the old roads which previously ran through the park from Windsor to Datchet and Old Windsor. These changes allowed the Royal Family to undertake the enclosure of a large area of parkland to form the private "Home Park" with no public roads passing through it. Queen Victoria had retreated to the castle for privacy following the death in 1861 of Prince Albert, who had in fact died at the castle. Albert was buried in a Mausoleum built at Frogmore, within the Home Park of the Castle (and eventually Victoria was buried beside him). Queen Victoria's retreat into the privacy of the castle after the death of Prince Albert acquired her the soubriquet "The Widow of Windsor". From Albert's death until her own death in 1901, Windsor Castle was Victoria's principal home, and she seldom visited Buckingham Palace again. The prince's rooms were maintained exactly as they had been at the moment of his death, and although an air of melancholy was allowed to settle on the castle for the remainder of the nineteenth century, this did not prevent improvements and restoration from taking place. In 1866 Anthony Salvin created the Grand Staircase in the State Apartments ("C"). This great stone staircase in the Gothic style rises to a double-height hall lit by a vaulted lantern tower. The hall is decorated with arms and armor, including the suit of armor worn by King Henry VIII, made in 1540. The top of the stairs are flanked by life-size equestrian statues mounted by knights in armor. This theme of decoration continues into the Queen's Guard Chamber and the Grand Vestibule. Salvin also added the chateau-style conical roof to the Curfew Tower ("T") at this time. Following the accession of King Edward VII in 1901, the castle often remained empty for long periods, the new King preferring his other homes elsewhere. The King visited for Ascot week and Easter. One of the few alterations he made was to lay out the castle's golf course. Edward VII's successor George V, who was King from 1910 until his death in 1936, also preferred his other country homes. However, his wife Queen Mary was a great connoisseur of the arts, and not only sought out and reacquired long-dispersed items of furniture from the castle, but also acquired many new works of art to furnish the state rooms. She also rearranged the fashion in which the castle was used, abandoning the baroque idea of a large suite of state rooms reserved just for important guests on the principal floor. New, more comfortable bedrooms with modern bathrooms were installed on the upper floors, allowing the formerly reserved state rooms below to be used for entertaining and court functions. The state bedroom itself was retained, but more as a historical curiosity. It has not been used as a bedroom since 1909. Queen Mary was a lover of all things miniature, and had created a large dolls' house, based on a large aristocratic mansion—it was designed by the architect Lutyens. Its furniture and picture were created by the great craftsmen and designers of the 1930s. The dolls' house today is one of the castle's many tourist attractions. George VI came to the throne in 1936 following the abdication of his brother Edward VIII; on December 11 Edward had broadcast his abdication speech to the British Empire from the castle, but had preferred during his short reign to live at his home Fort Belvedere in Windsor Great Park. George VI (and his wife Queen Elizabeth) preferred their original Windsor home, Royal Lodge. On the outbreak of World War II in 1939 the castle resumed its role as a royal fortress, and the King and Queen and their children Princess Elizabeth (the future Queen Elizabeth II) and Princess Margaret lived, for safety, in the castle. The King and Queen drove daily to London, returning to Windsor to sleep, although at the time this was a well-kept secret, as for propaganda and morale purposes it was reported that the king was still residing full-time at Buckingham Palace. Following the cessation of hostilities in 1945, the Royal Family left Windsor Castle and returned to Royal Lodge. 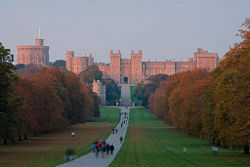 Queen Elizabeth II decided in 1952 (the year she ascended the throne) to make Windsor her principal weekend retreat. The private apartments ("D") which had not been properly occupied since the era of Queen Mary were renovated and further modernized, and the Queen, Prince Philip and their two children at that time, Charles and Anne, took up residence. This arrangement has continued to the present day. On November 20, 1992 a fire which began in the Queen's private chapel (between "C" and "D" on plan) quickly spread. The fire raged for 15 hours until it had destroyed nine of the principal state rooms, and severely damaged over 100 more—in all the larger part of the upper ward. One-fifth of the floor space of the castle was damaged—an area of 10,764 square yards. The restoration program took five years to complete, 70 percent funded by the decision to open to the public for the first time the state rooms of Buckingham Palace. The total cost of repairing the damage was $59.2 million. The restoration was undertaken at no additional cost to the British taxpayer. 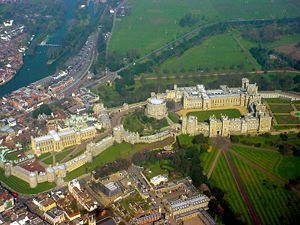 During the latter half of the twentieth century Windsor Castle became one of Britain's major tourist attractions. In latter years, the Queen has increasingly used the castle as a royal palace as well as her weekend home. It is as often used for state banquets and official entertaining as is Buckingham Palace. During the Queen's tenure of the Castle, much has been done, not only to restore and maintain the fabric of the building, but also to transform it into a major British tourist attraction. This has had to be achieved in co-ordination with the castle's role as a working royal palace. In a June 1999 story, the BBC reported that Prince Charles was considering moving the royal court to Windsor Castle instead of Buckingham Palace when he ascends the throne. The story speculated that the Prince may be attempting to gain more independence from the traditional court at Buckingham Palace. So far, the Palace has not commented on the story, but Prince Charles, along with the rest of the royal family, is said to be fond of Windsor Castle. 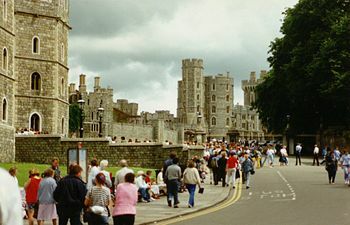 On September 30, 2006 it was reported that the Queen, as part of the equal opportunities policy at Windsor, has allowed an office in the Castle to be used as a Muslim prayer room when required, as requested by an employee. 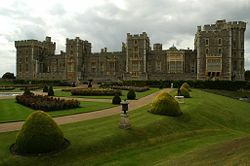 Windsor Castle was one of three royal sites excavated over four days by the Time Team of archaeologists led by Tony Robinson, on August 25-28, 2006. The archaeologists had an unprecedented opportunity to probe the geophysics and history of three royal residences over a four-day period, with teams working concurrently in the three locations. In the Upper Ward, the foundations of the Round Table building erected in 1344 by Edward III were discovered, and also, among other finds, a spectacular, decorated medieval tile in situ. In Edward's day the Round Table building, 200 feet in diameter, was used for feasting, festivals, and theatrical re-enactments of the Knights of the Round Table of Arthurian legend. In the Lower Ward, the Great Hall of Henry III's palace was located and one of its walls, still standing, was found. This has assisted archaeologists in assessing where Windsor's first palace actually stood. These finds have added to knowledge of the location, history, and uses of the Round Table and the Great Hall. ↑ The highest order of British knighthood, instituted by Edward III about 1348. All links retrieved August 4, 2013. Windsor Castle at English Monarchs. www.englishmonarchs.co.uk. British Tours Ltd - Quicktime VR of Windsor Castle across the Thames. www.britishtours.com. This page was last modified on 4 August 2013, at 19:17.